My friends and I drive our rental car north from Kihei, around the outskirts of Kahalui, and then southward on the northeast coast of Maui to the little town of Hana. This all-day drive is legendary, mainly because the paved two lane road twists and turns along the scenic coastline. This is also the wet side of the island of Maui, so be prepared if you decide to do this drive. NOTE – If you plan to use the guide below, the intersection of Dairy Road and the Hana Highway is mile number zero. Each paragraph below displays the mileage number in bold at the start of the narrative. Watch for the highway markers along the way, since they are keyed to these same distances. Before you leave for this driving tour (or preferably before you leave home), download an audio driving tour of the Road to Hana. Search for “Hana Highway audio tour” on your favourite media site. Many of these tour products are actually apps that run on your smartphone, and include more than just narration. Features such as: GPS location, maps, photos, and nice music are often included. All are modestly priced at $5-$10. 3.0 – Sugar cane fields have been a part of the Maui landscape since the 1860’s, when a market was found for sugar in the California Gold Rush. 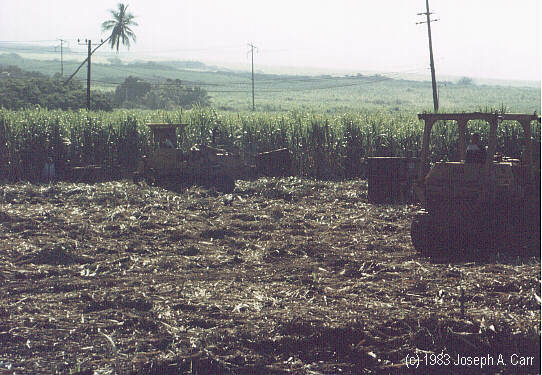 Maui currently has approximately 50,000 acres of sugar cane under cultivation. Sugar mills still operate here, in the midst of the swaying sugar cane fields. When the cane fields are ready to be harvested, they are set ablaze in order to get rid of most of the foliage, since the sugar is in the stalk. The sugar mill processes the cane into molasses, which is then trucked to Kahalui harbour, where it is shipped to the mainland for further processing. 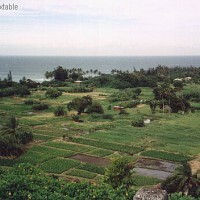 5.0 – Paia is a plantation town, and is the first town encountered when heading west from Kahalui. Windsurfers are now becoming the main industry for this former sugar town, since the north shores of Maui in this area offers superb onshore winds. This is your last chance to fill up with gas. 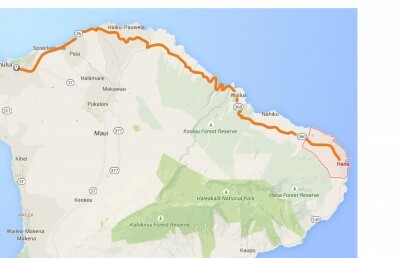 If the Paia gas stations are closed, return to Kahalui to gas up before proceed further. You have over 100 miles (return trip) of highway ahead of you! 8.0 – Hookipa Beach is a mecca for surfing and wind surfers. Surfing is said to have been invented by the ancient Hawaiians. Mama’s Fishouse is located near here, and serves some of the best seafood to be found on the islands. Expensive, but recommended. 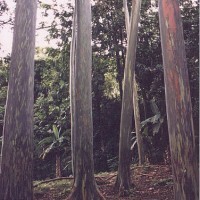 9.4 – Waikamoi Ridge trail is a short walk through the lush forest. 9.8 – Waikamoi Ridge pool and bridge is a good place to have a swim in a tropical pool. 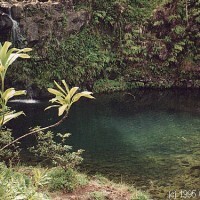 11.0 – Puohokamoa Falls waterfall and pool. 12.0 – Kaumahina State Wayside Park – restrooms and rubbish bins. Good view of coast, and Honomanu Bay. Pandanus grows here, and is used for baskets and mats, and was used for clothing by the ancient Hawaiians. 12.3 – Honomanu Bay “The Bay of Sharks” – there are 1,000 foot waterfalls above the bay. Not suitable for swimming. The road starts to narrow at this point. Please beware of large trucks. Wait until you are almost past the bay, where there are some good pulloffs for viewing. 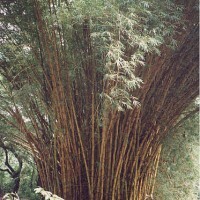 15.7 – Keanae Arboretum – giant bamboo, and many other native flowers and trees are easy to see. You will spot gum trees, impatiens, and many more plants as you take this gentle walk through the grounds. A camera is a must. After seeing the arboretum, carry on down the highway a short distance, and take the road to the left leading down to the Keanae Peninsula. The Ihiihiolehowao na Kaua Church (built in 1860 of lava rock) is worth seeing, as is the rugged black lava rock shoreline and pounding turquoise water. Turn left back onto the highway, to continue your journey. NOTE – at mile marker 16, the highway number changes from from 36 to 360, and the mile markers start over at zero. 18.2 – Turn left into the village of Wailua, where you will find 100 year old St. Gabriel’s Church. Drive down the road further until you see the “Dead End” sign, and turn right. Drive for a short distance on this private road to see the lush taro fields, cattle, and beautiful Waikani Falls in the background to the southwest. When coming out of this road, do not turn right (dead-end)! Turn left, back to the highway. 22.4 – Puaakaa State Park – beautiful tropical pools, trails, etc. The most rainfall occurs on this part of the Hana coast – up to 365 inches of rain per year. Have a look at the water viaduct, which were built near the turn of the century by Chinese labourers. These viaducts and irrigation ditches are managed by the East Maui Water Company, which supplies water from this “wet” side of Maui to the sugar cane and pineapple fields on the drier side of the island, in the valley where the city of Kahalui is found. 25.1 – Nahiku – there are many fruit and flower stands between here and Hana. Why not stop and sample? 32.0 – Waianapanapa State Park, just past Hana airport. Say awhile, and walk around this interesting park. The shoreline has some spectacular natural arches, blowholes, grottos, and of course, the vivid turquoise water. A beautiful black sand beach is an easy walk down the trail to the shore. Turn left back onto the Hana Highway – you are almost at Hana! 33.4 – Hana – “land of the low-lying sky”. Isolation ensures that Hana is mostly unchanged. Once you get to the Y intersection (where the police station is located), first take the lower road to Hana Bay. Snack Bar, pier, and Kauiki Hill – a site of many battles. Turn left after leaving the bay. The town of Hana has one hotel (the Hana Maui Hotel), several churches and two stores. 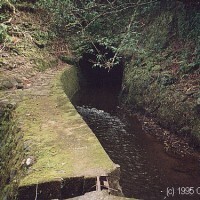 The road between Keanae and Hana was built of stone in 1927, and was paved in 1962. The Hana Highway has 56 bridges, and over 600 curves! 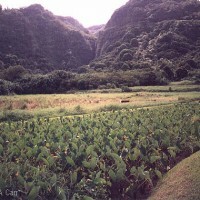 Unless you simply must see Oheo Gulch, I would recommend turning back after seeing Hana. 51.7 – Koki Beach and Hamoa Beach – Alau Island is just offshore, and is a very picturesque “tropical island”, as well as being a bird sanctuary. Hamoa Beach is one of the most beautiful in Hawaii. Double back, then turn left back onto the main road. NOTE – Mile markers start counting downward beyond this point. The road becomes even narrower now – less than one lane wide! Be prepared to pull off to allow oncoming traffic get past you, and proceed very slowly. 46.8 – Wailua Falls 95 feet high. 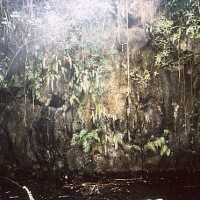 44.0 – Oheo Gulch (Seven Pools) – although there are not seven pools here, this is the common name for this lush tropical area. 43.0 – Kipahulu – Palapala Hoomau Church (built in 1857) and Charles Lindbergh’s grave. If you are driving the Hana Highway to the town of Hana, you should depart by no later than 9:00am. If you plan to travel past Hana to the Oheo Gulch (Seven Pools) area, give yourself an extra hour (minimum). If you are leaving from the Lahaina/Kaanapali area, leave no later than 8:30am…earlier if you are going past Hana. Take food with you for a picnic lunch and snacks along the way. Take water and/or soft drinks as well. There are no food stores once you pass the town of Paia, until you get to Hana. Gas up your car by the time you get to Paia. There are no gas stations until you get to Hana. If at all possible, have two drivers available to share the driving duties. (You will have to arrange this ahead of time with your car rental agency.) There are many sights to see along the Hana Highway, and there are often no places to stop – therefore the driver will miss much of this beautiful drive. Also, driver fatigue and stress can easily set in along this road, due to the many sharp turns, narrow lane widths, poor surface, rainy weather, steep drop offs, and other road hazards. If you are considering going past Hana to the Oheo Gulch (Seven Pools) area, double check your car rental agreement. Some forbid travel past Hana on this road. Plan to encounter delays along the route. Delays are not uncommon, since the Hana Highway requires constant repairs by road crews. Please don’t let these cautions deter you from travelling the Hana Highway. It is well worth the trip! Nov 26, 1995 – The Islet of Molokini is located off the southwest coast of Maui, and is formed from the tip of a volcano, which just breaks out of the water. 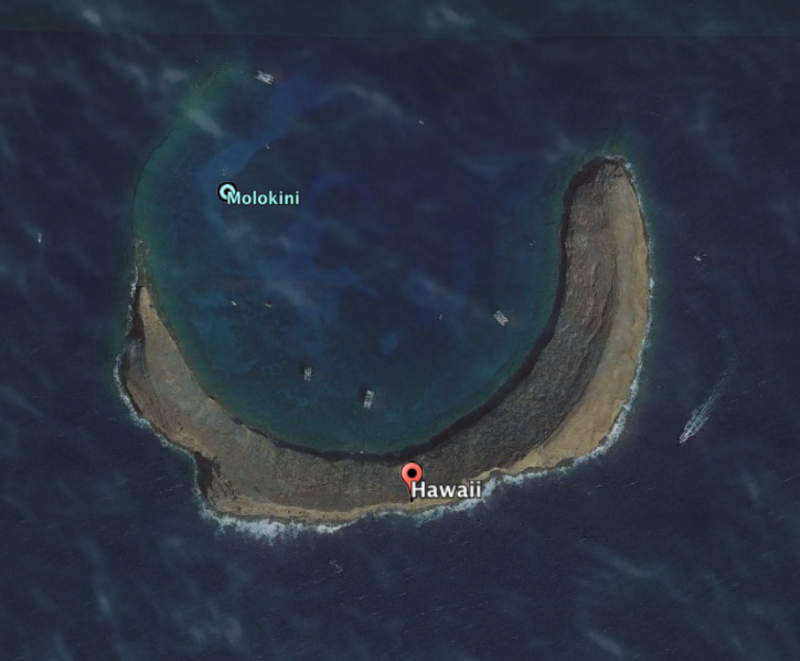 The island is a crescent shape, and forms a beautiful lagoon inside, where lots of fish congregate. Snorkel cruises to Molokini abound, and we decided to take the Prince Kuhio, a 92 foot mono-hull diesel-powered cruiser (no longer running). There are many, many cruises offered to Molokini, (both power and sail, and mono-hull, catamaran and trimaran) so you should find one that suits your taste in boats. Our itinerary included an early morning pickup from our condo, then we departed from nearby Maalaea Bay for the islet of Molokini. A breakfast of juice, coffee, muffins and fruit is served buffet-style, while we make our way to the island. After arriving at the island mid-morning, the boat is tied to mooring anchors set in the lagoon, and we are off snorkelling. All equipment is provided. You must be able to swim, since the lagoon is about 50 feet deep, however swim boards are provided for those who lack confidence, or who are weak swimmers. The shore of Molokini is very steep, and consists of very rough lava rock. 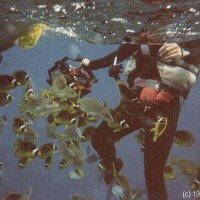 It is not recommended that snorkelers swim ashore, since it is difficult to climb ashore, and there are strong currents near shore. The ship’s crew is in the water with you at all times, and are ready to assist you, should you need help. Snorkelling time available is about 2 hours, however we were tired out after about an hour and a quarter. While there, we had our adventure video taped by one of the crew. This is a good idea, since taking pictures underwater is tricky at best, and these professionals do a good job – giving you an excellent, personalized souvenir of your trip to Molokini. The video is edited onboard, and is ready for you when you depart a few hours later. Not expensive. It is quite a thrill to get close to tropical fish. Of course, with that many boats (30 or so) going to Molokini every day, the fish are well rehearsed! They expect to be fed once the boats arrive, and they swarm around the snorkelers as soon as you enter the water. The Prince Kuhio (and some other Molokini boats) offer as an extra cost option Snuba gear. This is a cross between snorkeling and full scuba gear. With Snuba, you don’t need to be previously certified for scuba diving. Snuba instruction is given onboard and in the lagoon. The tanks are floated on a raft on the surface, and air supply hoses are ganged off these tanks to the Snuba divers below. This allows you to go to the bottom of the lagoon, whereas snorkelers are confined to the surface, and can usually only dive down 10 feet or so for short periods of time. I can’t see the benefits of Snuba, since the fish are all near the surface anyway. Not recommended. As we were pulling into Maalaea Bay at the end of our return trip, we spotted some large turtles in the bay – an added bonus to the trip! Apparently, the turtles nest ashore in the nearby salt flats. We were back at our condo by mid-afternoon. Even if you don’t swim or don’t feel like snorkeling, this trip would be well worth taking. 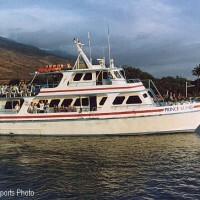 Molokini cruises offer good value for a day out on the water. Depending on the season, you might also see turtles (as we did), or Humpback Whales. Recommended. The water at Molokini is quite cool, as compared with the water temperature you find on the Maui beaches. I would guess the water temperature is between 72 and 74 degrees Fahrenheit. If you do not have much body fat, you may find that you cannot stand to stay in the water for more than 15 minutes or so. If you start to shiver while in the water, return to the boat, immediately dry off, and warm yourself up. Don’t hesitate to ask the ship’s crew to assist you, if you need it. The trip to and from Molokini can encounter some ocean swells. If you are prone to sea sickness, take your medication before leaving. The drive from our condo in Kihei to the top of Haleakela and back – an easy half day trip. 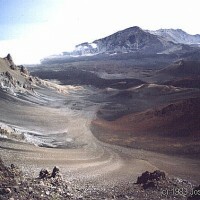 Haleakala volcano is 3,058 metres (10,033 feet high). Driving to the summit will take about two hours from Kahului, assuming you take your time to see the sights along the way. Give yourself an extra 20 minutes if you are traveling from Kihei or Wailea, or give yourself an extra 45 minutes if you are driving from Lahaina/Kaanapali. The road is paved the whole way, although the upper half of the route has many hairpin turns and is quite narrow. Haleakela National Park charges a modest per car fee, which is collected at a toll booth on the way up the mountain. Make sure your car has a full tank of gas and check all fluid levels before you leave. There are no service stations once you pass Pukalani on Highway 37, so it is up to you to ensure your vehicle is in good condition. Speaking of being prepared – you should take some snacks and drinks with you. Although there is a restaurant and lodge in Kula on Highway 377, most visitors get hungry or thirsty while up on the summit, so bring food and drinks with you. Leave yourself at least a half hour to experience the strange sights from the summit. The weather on the summit is not easily predictable. It can be sunny or rainy – or both! Keep in mind, you are at 3,000 metres elevation, so the air temperature will be quite cool. Take a jacket. 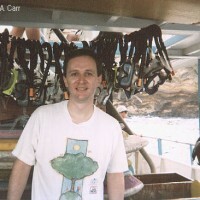 Likewise, it is impossible to predict whether you will be able to view the scenery of Maui from the summit or not. Obscuring clouds come and go…just because you see clouds while driving up the mountain, doesn’t mean they won’t clear by the time you reach the summit. There are many unusual and contrasting colours at this elevation, so take lots of pictures. 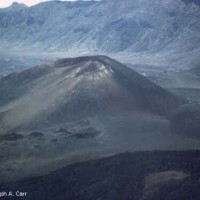 Compare my photos of the crater taken in 1983 with the ones taken of the same area in 1995. There are some interesting cinder cones inside the crater. 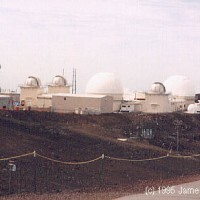 Although there are observatories and repeater stations on the summit, there is no access permitted to this area. There are some spectacular silver sword plants to see, depending on the season. Please remember – don’t touch. 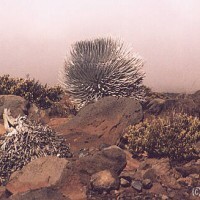 The ecology in Haleakala National Park is very fragile. Please observe signs which restrict access to certain areas used by the nene, or native Hawaiian goose. On the way up, observe the transitions through several ecosystems – from the tropical valley floor, through the temperate forests on the lower slopes, to grasslands on the middle slopes. The higher elevations have very little vegetation, except the hardiest of plant varieties. You never know what you will encounter on these trips. 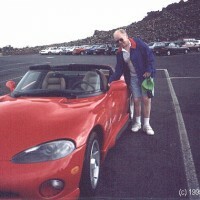 Who would have thought that a Viper sports car would be parked at the top? One last warning – traveling from sea level to 3,000 metres (10,000 feet) so rapidly is hard on the human respiratory system. If you have a heart condition, or have respiratory ailments, think twice before making this trip. Hardly a day goes by without an ambulance having to take someone down from Haleakala. Even healthy individuals will find that the rapid climb to the summit can cause “fuzzy” sensations, feelings of slight nausea or loss of balance. While on the summit, take it easy. Walk slowly (even if you feel OK), and sit down for short rests on the benches provided. Haleakala is well worth seeing, so make sure you are one of the 99% of visitors who enjoy this unique experience. 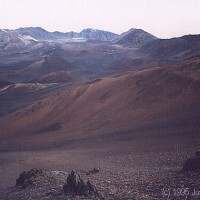 For the more adventuresome, there are many activities available within the Haleakala crater: hiking trips (3 cabins are available, reservations required), ranger-guided walks and hikes, concessionaire-guided trips through the crater, short, self-guided walks, and camping at Hosmer Grove Campground. 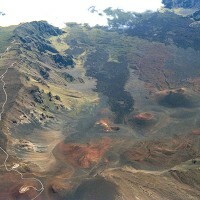 Although I have concentrated on the Haleakala Crater portion of Haleakala National Park, there is a second section to the park – the Kipahulu area. 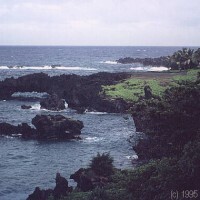 This coastal area can be reached by driving the road to Hana (Highway 360), and going past Hana on Highway 31 to the Oheo Gulch (Seven Pools) area. Hiking, swimming, camping, and picnicking is available in this area. Facilities at Kipahulu are primitive. Neither drinking water nor modern restrooms are available. If you are considering going to this area, check with the park administration first. Car rental agencies may prohibit the use of their vehicles on Highway 31, so check before you go.